This week we are reviewing a game that made runner-up for the Golden Geek Award's best two player game 2017 - Fox in the Forest. We purchased this game several months ago and have enjoyed playing it several times throughout the year. We often bring it to the table when we are looking for a good filler game, it is quick, simple and fun. 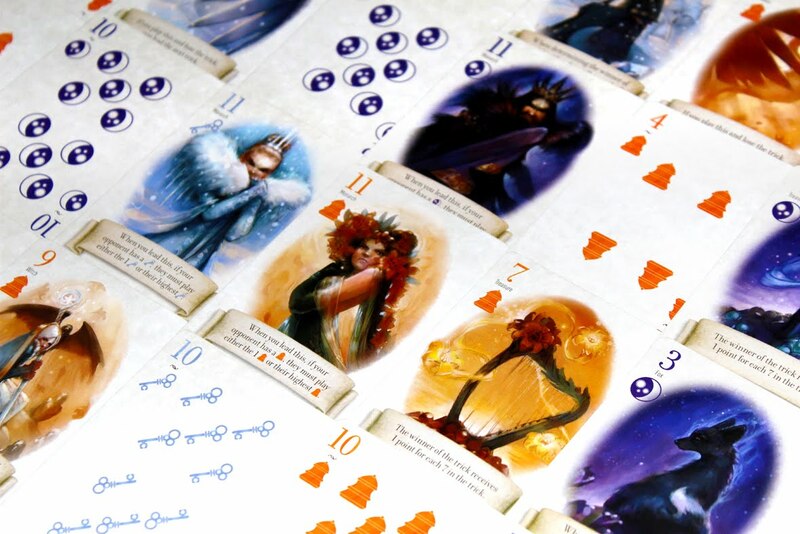 Fox in the Forest is a trick-taking game with a couple of twists. The game is themed around fairy tales and uses special ability cards and unusual scoring to distinguish it from games like Euchre or Diamonds. Odd numbered cards have different abilities such as treat this card as trump, replace trump with any card etc. These abilities can really change the course of the game. The unusual scoring also keeps players on their toes. The scoring depends on the number of tricks that you have taken at the end of a round, with players scoring the most points for taking 0-3 tricks or 7-9 tricks, any more or less and players won't score full points (6). This can make it hard when you are on a roll! The game is won when a player reaches twenty-one points, something that can be tricky (pun intended). This game is great, it is super easy to get to the table plays fast and can quickly get competitive. One of the best things about this game is the beautiful artwork, and its what drew us to the game. The small footprint of the game makes it ideal for travelling or camping, and its quick gameplay makes it possible to play on the run. For anyone who remembers playing Euchre with their family/friends, this game will bring back some memories and would be a great gateway game for players who like Euchre.